We are looking for individuals who want to start their own junk removal business with our branded name. Our founder, Pat Civitella, is a successful businessman and entrepreneur. He had been working on 1-800-Mr-Junker for over 5 years until he perfected a working model. We have a branded name that people can easily recognize and is self-explanatory. 1-800-Mr-Junker is all your customers need to know! We are looking for individuals throughout the U.S. who have a desire to start their own lucrative business. 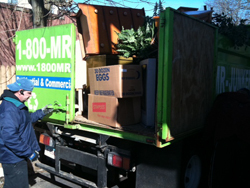 We can teach you everything about the business, but without the high cost of other junk removal businesses. People can get started for an initial fee of under $3000.00 for a license. Also, we have the ability to offer all back office duties for our licensees. We can provide all the bookings for appointments and more. We will also provide our licensees all of our operation manuals and advertising manuals. We are looking for highly motivated individuals that are interested in a solid business that they can grow and expand. If this is you, contact us and fill out an application!